TruVizion and Remote Spectrum products impress judges and score high in the annual cable technology rankings. 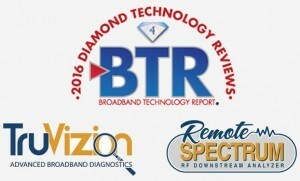 Alpharetta, GA (September 20, 2016) — ZCorum, a leader in diagnostics tools for broadband providers, announced that TruVizion and Remote Spectrum have received 4 Diamonds out of 5 in BTR’s 2016 Diamond Technology Reviews. The BTR award program recognizes top products and solutions available to the cable industry. The submissions are rigorously judged by a third-party panel of cable telecommunications engineering experts, including Engineering executives from Time Warner Cable, Bright House Networks, Suddenlink Communications, Comcast, Charter and Cox. Criteria included unique technology or application thereof, innovation, ease of use, efficiency, reliability, and contribution to profitability.